For the most part we ride our bikes because we love to ride. Some do it because they have to, others live close enough to work and even some just like the challenge or figuring out how much money they kept in their pockets rather than it going out the exhaust pipe. However, I can’t help but wonder….now that we’re on the road with a thousand other cars around us. 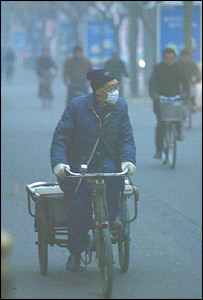 How unhealthy could bicycling be? I’ve gotten stuck behind cars and buses that spew out smoke right at my face and couldn’t breathe because of the junk. Then by the time I get home I can’t fully take in a lung full of air because I start coughing. So I’m curious to know could the benefits of commuting to work be out weighed by the health risks such as smog and even bicycle related accidents? One more reason to cut through reds rather than stand in idling traffic. But you might be surprised to learn how much pollution drivers are breathing – it’s more than you think. Cars take in pollution from the cars in front of and around them, and if the windows are up, that pollution is trapped in the car. I know there have been studies that have shown that levels of pollutants taken from a car are higher than samples taken from the side of the road or sidewalk – I’ll try and find them later. I’ll also try and find the study that shows that the health benefits of biking far surpass the potential health risks of pollution and injury. Ken Kifer: Is Cycling Dangerous? Commuting – Do cyclists breathe more pollution than motorists? It would be nice to have sources, but hey, this is the internet. I don’t think it’s possible to avoid pollution in this city. If I drive, I breathe as much, if not more, as I do on a bike. If I take the subway, I’m exposed to the metal dust of the tunnels, not to mention the germ bonanza of a train full of people during rush hour. I can say this, though: I have gotten some sort of cold or respiratory infection every winter for as long as I can remember. This year, I biked all winter and never got sick, even when my wife did. 1. If I have a choice between two parallel streets, I choose the one with less traffic. This means that my air is cleaner than on the congested street. 2. I live in Kentucky and work in Ohio. In Ohio, a biker is allowed to filter through traffic; in KY, this is against the law. When I’m in Ohio, if I get stopped behind a nasty bus, I just move to the side to get out of the exhaust. When I’m in Kentucky, if I want to remain legal, I must stay behind the bus, so I just get out of it as well as I can. Either way, if I was in a car, I’d be stuck there breathing it. Hackers Rule and Own. Thats how life goes….